Chronologium Academicus is to Academia and Time, What a World Map is to Geography and Place, would reveal the essence of Chronologium Academicus. We have long since taken for granted what a world map does for us. It provides an overview and feel for geographic place, proximity, and distance that a bound or computer-based atlas can not match. A world map’s display of continents and countries, cities and towns, rivers and forests allows us to visualize the world in its entirety, or view any part of it in relation to any other. Effectively, a world map is a reference tool that delimits and systematizes the scope, breadth, and parameters of world geography. Chronologium Academicus was conceived and developed as a reference tool that does for all of academia, what a world map does for all of geography. Just as a world map is a representation of the physical world, Chronologium Academicus is a representation of the academic landscape. Chronologium Academicus provides an overview of the “geographic” differentiations of academic areas, disciplines, and time that bound or computer-based references can not match. It presents the first visualization of the whole of history and academia, which effectively delimits and systematizes the scope, breadth, and parameters of academia. The layout devised for Chronologium Academicus was of central importance to its development. Vertically, its 14 columns present the history of every major academic discipline from the development of language by Neanderthal man to the present, and it’s bordered by 700 portraits of the greatest contributors to that history. However, its overwhelming distinction is its horizontal layout: at any point all the way across the columns, each row covers the same years. That feature places the isolated bits of information of every major discipline into the historical and academic context of every other discipline, which facilitates our ability to make linkages between events, individuals, and works that occurred during the same period. 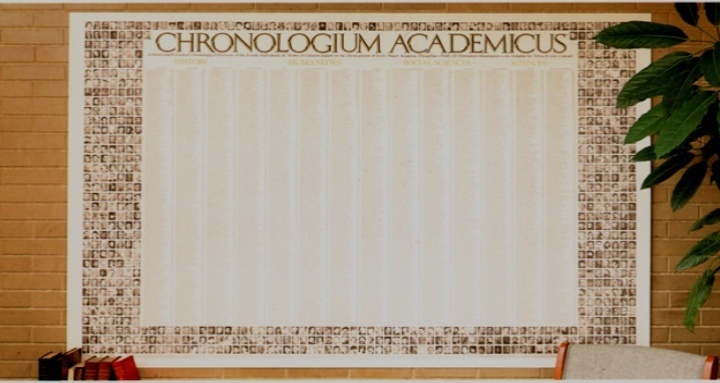 Thus, because Chronologium Academicus contains the linkages between disciplines that are not provided by our educational system, students can use it to systematize and recall what they currently know or will subsequently learn, and, recent and remote graduates can retain, reclaim, and/or reweave what they encountered during their education into something meaningful. It thereby enhances the perceived relevance and meaning of one’s own education. The three opening History columns of Chronologium Academicus are presented in geographic order from west to east, and the other 11 columns are laid out in three groupings (Humanities, Social Sciences, and Sciences) from the most normative to the most empirical disciplines. (See columns layout and key below). This unique view of all of academia has never been available before. By having Chronologium Academicus in each classroom, students can begin to more readily see and appreciate the place and import of every major academic discipline in relation to history and to all other disciplines. In the next section, WHY IT'S NEEDED, we expand on the rationale for adopting and displaying Chronologium Academicus.